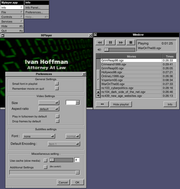 Mplayer.app is a GNUstep port of MPlayerOSX. Mplayer.app is a front-end/controller for MPlayer, using its --slave API. It supports queuing of media-formats supported by MPlayer in a playlist. The playback window it spawns is that of regular MPlayer. This page was last modified 10:54, 21 February 2019. This page has been accessed 26,925 times.